UML is a standard notation for the modeling language with a rich graphical notation, and comprehensive set of diagrams and elements. In other words, UML is an Industry standard modeling of real-world objects as a first step in developing an object-oriented design methodology. UML is an abbreviation of Unified Modeling Language which visualizes, specifies, documents and constructs artifacts of a software system in the engineering field. If you are given with a UML assignment then here you will learn some overview as well as essentials of UML which will be required in UML assignment writing. We have UML assignment writing professionals who can help you to approach this complicated subject perfectly. The purpose of creating UML is to craft, describe and explain an existing document or procedure of a new business. Well creating UML design is not just limited to this but it is also utilized in the nonsoftware systems too in the procedure such as flow in manufacturing unit. The UML design is not just made for the developers. But it is for any of the business user or any common individuals who want to understand the system can use this UML. UML is mainly referred to as successor of object-oriented design and analysis. The UML diagrams are much powerful to represent all the main concepts that exist in the object-oriented design and analysis. Thus, it is essential that you understand object-oriented concepts deeply initial and then dedicate on learning the UML. Objects: It consists of the data as well as methods which can control data. An object is the basic building of object-oriented fundamentals. Inheritance: It is a kind of method that makes new classes from the old. At the time of analysis, our experts of UML assignment help say that the objects are identified and then explained in a structured manner. This means that the objects are identified with responsibilities and these responsibilities get further collaborated and fulfill the purpose of existence in a system. In this level, the design is implemented with the use of object-oriented languages such as C++, Java, and more. At AssignmentHelp, our UML assignment help experts say relation among UML and object-oriented design is essential to be understood. The object-oriented design is transformed in the UML diagrams whenever required. The output of object-oriented analysis and design is being transferred to an input of the UML diagrams. 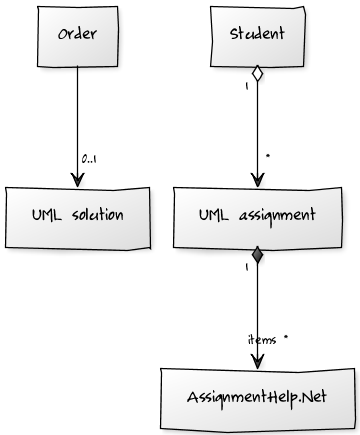 Are you stuck with your UML assignment due to some complication of the subject? Well then now you don’t have to worry about it as now every student around the globe is taking online UML assignment help from AssignmentHelp professionals and scoring top grades in their academics. The professors of the university across the globe are assigning students of Computer Science engineering with the assignment of UML. So, if you are getting stress and finding it tough to complete your assignment on given deadline, then you can seek for our help by getting in touch with us. The scholars whoever are studying masters or bachelors in Computer Science or IT are required to write as well as submit an incredible assignment on the UML. But the issues students face most of the time is lack of time, not having sufficient knowledge or great writing skills due to this they seek for best UML assignment help provider online. At AssignmentHelp, we offer the best UML assignment help writing services to the scholars which help them to score top grades in their academics. Our team of experts possess a Computer Science degree and are completely aware of the concepts of the UML to provide scholars with excellent UML assignment. UML is a branch of computer science engineering or software engineering that deals with the development of several kinds of applications and software with the use of some diagrams called UML diagrams. With these UML diagrams, the software developers are capable of visualizing complete design of the system or any software. There are different kinds of UML diagrams which covers a use case diagram, sequence diagrams, class diagrams, activity diagrams, collaboration diagram and some more. Our native writers are highly experienced in offering UML assignment writing services to the scholars on all the topics of UML. So, don’t wait anymore just order and avail incredible assignment with us! Why AssignmentHelp is the foremost choice for scholars? Charge affordable rates for the UML assignment as we understand scholars need to manage their complete expenses on their own. Are you a college student who gets stuck with their UML assignment? Then, what are you waiting for just approach us at AssignmentHelp and get the assistance instantly! AssignmentHelp.net will help you in your assignments. We have covered almost every topic related to UML diagram, trying to make it as simple as possible and information rich so that you can learn how to design UML diagram so that you can do UML assignment yourself. However if you are not able to do your UML assignment and looking for UML assignment help or UML homework help then where you will go? We will also put some UML ppt shortly. This tutorial is designed by our UML expert who can also provide you UML help with university assignment and they available online 24x7. You can submit your assignment or homework related to UML language and our exports will get it done in short duration of time.